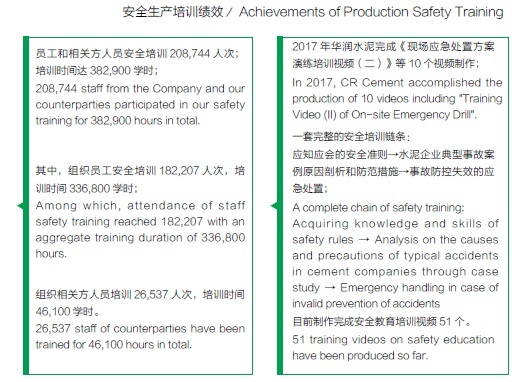 CR Cement strictly abides by the "Production Safety Law of the People's Republic of China", continuously implements the standardization of production safety, and constantly consolidates foundational management and innovative management models, for improving the intrinsic safety and overall safety management level. By virtue of improving management system, implementing management control over high-risk operation and enhancing the safety management of stakeholders, we promote safe and sustainable development of the Company as well as pursuit beyond profits through activities such as assistance guidance, supervision, inspection, training, cultural practices and responsibility assessment. In the meantime, we constantly strengthen our safety risk management and control for achieving prevention of safety risks through management and technology. CR Cement continuously improves the management system based on the EHS (Environment, Health, Safety) Management Section in the "Management Manual of CR Cement" and establishes targeted systems and standards after analysis on the loopholes of safety management. The Company continuously improves relevant production safety regulations. In 2017, 5 systems and regulations were promulgated in 2017, namely, "EHS Accountability System for EHS Positions", "Regulations on Accountability of EHS Incidents (2017 Edition)", "Regulations of Occupational Health Management", "Regulations on the Safety Management of Operations at Height", and "Onsite Contingency Plan for Production Safety Accidents (II)", further improving our production safety management system. CR Cement maintains an EHS management committee which is chaired by the CEO. The management structure of production safety features with three tiers including headquarters, major regions and production plants, EHS department of a production plant is directly managed by the person in charge of that production plant. In 2017, the Company had a total of 205 specialised safety management staff. The EHS organization system of the Company follows the principle of "three-tiered management and control", which consists of EHS organizations in the headquarters, major regions and production plants. EHS organizations at each level include EHS committee, EHS supervision and management department and EHS supporting department. Implementation of safety performance assessment According to the "Production Safety Accountability Statement of the Group", we stipulate "production safety goals", including fatalities rate, serious injuries, confirmed occupational diseases and rate of injuries per one thousand people, which are subject to regular assessments. In January 2017, an assessment was conducted based on the EHS accountability statement entered into in 2016. The results were included in the annual performance contract as safety coefficients to promote implementation of safety performance assessment. In early 2017, the CEO entered into “2017 EHS Accountability Statement” with persons in charge of regional offices and departments. CR Cement EHS Accountability Statement adopts the coefficient system in assessing persons in charge of major regions, departments and regional EHS offices. All major regions and production plants also entered into accountability statements at each level such that the implementation responsibilities are divided among all staff and the requirement of "one post with dual responsibilities" is satisfied. 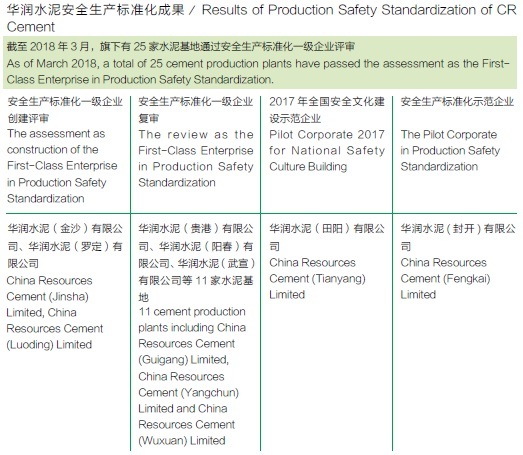 CR Cement continuously carries out the construction of first-class enterprise in terms of production safety standardization. We keep reinforcing foundational management, enhance intrinsic safety protection facilities, effectively prevent safety accidents, promote team building and satisfaction of job requirements, and build the habit of self safety practice. 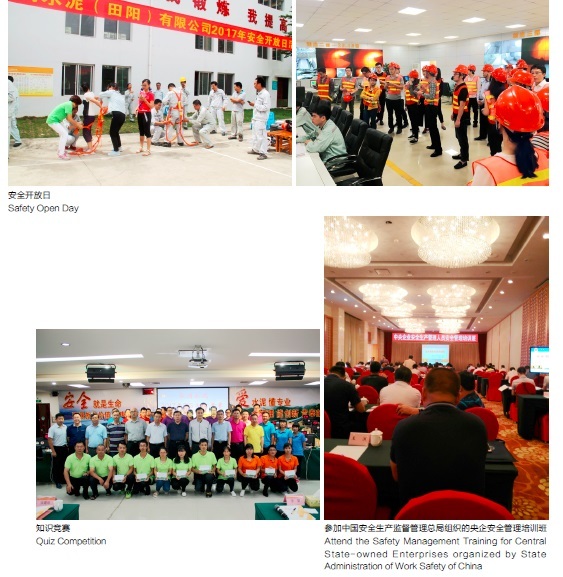 Besides, we organise external audits on safety standardization system by China Building Material Test & Certification Group Company Limited ("CTC") for constant consolidation of our achievements and continuous improvement. At the same time, CR Cement improves the overall safety management level and influence through construction of first-class standardized enterprise in terms of production safety. China Resources Cement (Tianyang) Limited was honoured "Pilot Corporate 2017 for National Safety Culture Building" by the Association of Work Safety of China. In 2017, based on the analysis on the causes of accidents, we proposed to encourage the staff to prepare and study the "Safety Notice Cards of Job Positions". Through the preparation and production of safety notice cards of their own job positions, every staff familiarised themselves with the operational safety risks and safety measures at their job positions. At the same time, by signing on the "Safety Notice Cards of Job Positions" and attending the relevant training organised by the Company, the staff would fully understand the safety risks at their job positions and undertake not to commence work without implementing safety measures, thereby eliminating violations of regulations and policies. According to the tests conducted by a third-party organization, namely Research and Testing Centre for Chemical Engineering and Environment of Guizhou University, total dust limit and respiratory restriction met the dust emission requirements of national occupational health on packaging and delivery. In order to manage and control the safety risks of clearing work at cement silos, staff are prevented from entering high- risk areas to reduce the risks of silo clearing. Longyan Company launched reforms on mechanical silo clearing by replacing manual clearing. During silo clearing operation, we firstly use magnetic sound energy technology to clear the powders stuck on the walls, and then shake and hit the silo walls with air cannon to loosen and drop the cement, thus eliminating the potential risk of collapse of materials hung on walls. CR Cement attaches great importance to safety training. The holding headquarters and its subordinate regions and production plants regularly formulate production safety training plans and assess the implementation of specific training. In 2017, 10 training videos of practical emergency drills were produced to provide training resources for emergency drills in production plants. During the year, special training classes covering safety on production, mining and transportation were conducted, with 131 participants in attendance. 7 training activities organized by external parties and 278 people participated. Production departments of each production plant fully launched on-site emergency drilling events by units of sections and groups, achieving significant results. 625 emergency drills with a total of 12,400 participants were conducted for the year. CR Cement proactively organized various types of safety events. Approximately 100 events including safety open day and road safety week were launched at each major region and production plant. Safety events have effectively encouraged all-staff participation in safety management, improved corporate safety culture, and infiltrated safety management in staff, their families and the society. 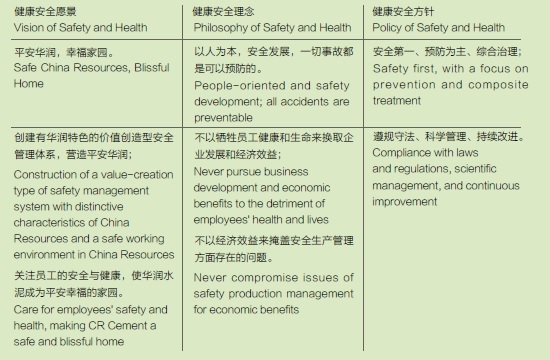 CR Cement strictly abides by the "Law of the People's Republic of China on the Prevention and Treatment of Occupational Diseases" and formulated the "Management Regulations of Occupational Health" accordingly. 100% coverage rate of OHSAS18000 Occupational Health and Safety Management System; 100% coverage rate of staff body checks. In 2017, CR Cement actively organized a wide variety of health events for all our staff. We organised our staff and their family members to participate in activities such as Family Day and healthy hiking. 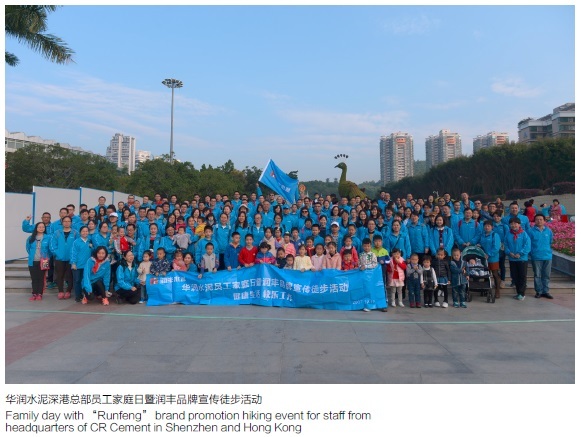 We held activities such as "Runfeng Cup" basketball games, badminton competitions as well as exercises at work, thereby creating a good corporate atmosphere which enhanced team cohesion while advocating concepts of healthy life.